"I was seriously considering leaving Middle Earth for good this time, my dear friend. It has been so long since our kin in Valinor returned to these lands, many of them cursed never to step foot on Aman ever again after the first kinslaying. But most were pardoned since then and were allowed to return. Yes, I do long to see the Undying Lands, my friend. But war is brewing in the east and Angmar to the north is spreading its evil shadows over Eriador again. The Age of the Elves is ending, the Age of Men will come, but only if the shadows are defeated and the war is over, with the Free Peoples victorious. Until then, I will remain in Middle Earth to rally as many of the few Noldor who are still here as I can. I am no leader nor do I seek to become one. But I do believe there are other Noldor in this Middle Earth who share this dream of mine: to see these lands free of all evil before sailing into the West. 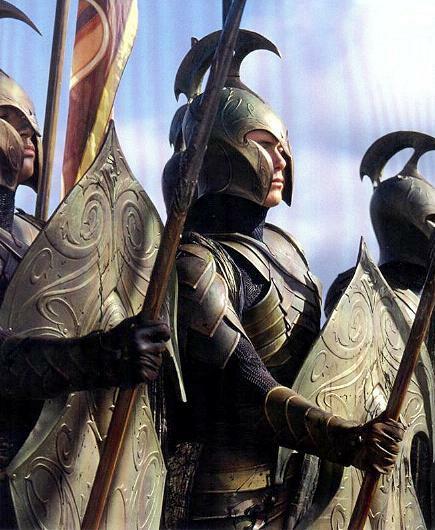 And I will gladly draw my sword with them in the name of Gil-galad, last High King of the Noldor-in-Exile! ", said Golchador, a glimmer of hope and pride appearing in his eyes. "But you have no sword to draw. ", replied his friend with a sigh and a shake of his head, always true to his serious and dour demeanour, "The next ship for Valinor is leaving on the morrow. You better prepare yourself before it is too late. Dreamer..."
The "Rendir-e-'rovan" ("Rendir en rhovan" in game meaning "wanderers of the wilderness" in Sindarin) are a small company of Elves hailing from Eregion, Rivendell and Lindon who, unlike most of their people, refuse to leave Middle Earth until the War of the Ring is over. They spend most of their time wandering, hunting wild animals and servants of the Enemy, or practising their great skill in crafting: weapons, shields, armour, jewellery and various trinkets meant as gifts for those they trust and consider friends, their imagination being the only true limit. In their spare time, they gather in elven hubs throughout Eriador or they camp in the wilderness to share a meal or a drink, a tale or a song or three... They can occasionally be seen in the company of Rangers of the North, fighting side by side or exchanging stories with them around a camp fire, as they have done many times in the past during their long lives. 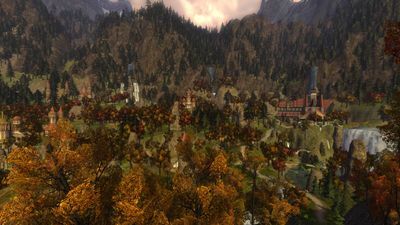 Currently scattered around the lands, with some wandering about the Trollshaws, others in Ered Luin with the choice of leaving Middle Earth or staying behind still ahead of them and others on the road in between, the Noldorin Elves who call themselves "Rendir-e-'rovan" are slowly making their way to the Elven refuge of Rivendell. With the Trollshaws being beset by many terrible creatures and evil Men, while the sons of Elrond, Elrohir and Elladan, have set out with a group of Rangers of the North for Rohan to help the Fellowship of the Ring in its journey to Mordor, the "Rendir" have two paths laid before them: to stay and protect Eriador from its enemies or journey south to join the Grey Company in its efforts to aid Aragorn and the rest of the Fellowship in their task of utmost importance. Rendir-e-'rovan (Rendir en rhovan in game) is a Rank 10 mature Heavy-RP Kinship on the Landroval LOTRO server, focusing on the lives of a small company of wandering Elves as they prepare for their last war in Middle Earth and their interactions with the other races of the Free Peoples and the servants of the Enemy during their journeys. We accept Noldorin Elves only. Dwarves, Hobbits, Men and other clans of Elves may not become part of our kinship, but they can still join us in our roleplay events throughout Eriador. We engage regularly in roleplay in various places in Eriador, either among ourselves as a kinship or with other characters that we may meet during our travels regardless of the kinship they may belong to. We also hold regular roleplay events every Saturday at 7pm server time. 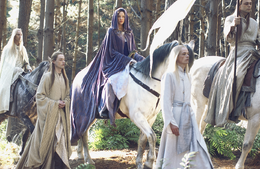 We understand that we are assuming a rather difficult role in playing Tolkien's Noldorin Elves, hence why we expect potential members to have a good understanding of the lore of Middle Earth, even though they don't have to be lore masters. This is the reason why new members need to undergo a one-month-long probationary period. However, we greatly respect our members' Real Life™ and we hope we aren't demanding when we ask them to participate in at least one event per month.